I've learned a few things lately and one of those things is that 'acts of love' as Christians doesn't come as easily as I once thought. Right up front, I want to say that when we ask Jesus to be our savior, we don't magically start loving people the way God wants us too. It's true that for a little while when accept Jesus as our Lord and savior, we want to tell everyone about God and how that Jesus died for us and we want EVERYONE to know him like we do. Overtime though, the 'newness' wears off and the things of this world start weighing us back down. People begin to irritate us. We start getting annoyed by the way people act. So, instead of wanting to help those types of people, we steer ourselves toward those who are more willing to listen about Christ or those who show an interest in him (which isn't very often in today's world). We may even limit ourselves to those we see at church or the kids in our Sunday school classes. But, what about those we encounter daily? Showing God's love to others should come easily. So, why doesn't it? Today's lesson is on 'acts of love' or 'showing God's love to others' and how easy or hard it truly can be. Children (and adults) may have a hard time understanding the numerous different ways that we can show God's love to others, but hopefully by the end of this lesson, they will see how truly easy it can be. Ask for a show of hands to the following questions, but ask the kids to refrain from talking about the people they feel this way about. "How many of you have someone in your life that you don't like?" "How many of you have someone in your life that irritates you badly?" "What about a teacher or principal?" "Do you have someone who used to be your friend until something happened and now they are no longer your friend?" The bible tells us in Mark12:31 KJV ~ Thou shalt love thy neighbour as thyself. Jesus didn't say, "Try to love thy neighbor as thyself". He said, "Thou shalt!" That lets us know that as Christians, no matter what happens, we are to love our neighbours. So, exactly who are our neighbors? Well, if you look at the parable of The Good Samaritan, we find that everyone is our neighbor. Okay, so exactly how can we show God's love to others? We can show God's love to others by the acts of love we do. These small (or big) acts of love show others God's love through us. Jason Gray, a Christian music artist, has a song about this exact thing. Take a moment to watch it below, then show it to your kids in your Sunday schoool class. My kiddos learn better when they can visually see something rather than just me telling them. Whenever you get a chance to show your kids visually, I recommend you do so! Now, as you can see in this video, even the smallest acts of love can help build the kingdom of God. I used the reference in the song about how God put a million million doors in this world for his love to walk through. I told each child that they were a door for God's love and that they needed to open that door to let His love out. I saw this activity somewhere and I'd link to it if I could find it, but I can't. It is a really good 'visual' example of how showing God's love to others helps his love to spread from one person to another. Get a colored sheet of paper and scissors. Any sheet of paper will do, but if you are in front of a larger class, colored paper can be seen better. Now, have the kids count how many corners are on that piece of paper. Of course, there are four corners. Next, tell the kids you are going to cut off one corner of the piece of paper and that that corner will represent a piece of God's love. Once you have cut off the corner, have the kids count how many corners the paper has now. It has 5!! So, even though you took some of God's love out, it grew more!!! Now, cut another corner off and give that part of God's love away to someone. Count the corners again. There are now 6!!! You can continue this to the next couple of corners to make sure the children understand what you are doing. The more we give God's love away or 'show God's love' the more his love grows in others!! Sometimes, people may not want your kindness, but give it anyway! God lets each of us choose whether or not we will give his love to others or hold it in. God never makes us do anything. So, when the time comes and you have the choice to do an act of love, like in the video, do it! Don't hesitate because if you don't show an act of love, God's love won't grow through you. Be the door that God's love can walk through!! Just like the song above!!! If you'd like another activity for your kids, here is a free crossword puzzle centered around The Good Samaritan. I love this bible story because not only does it show the bravery of women, but it also shows that God uses women as well as men. So, listen up girls and boys - God can and WILL use you no matter what age, color, or even if you are a boy or a girl. 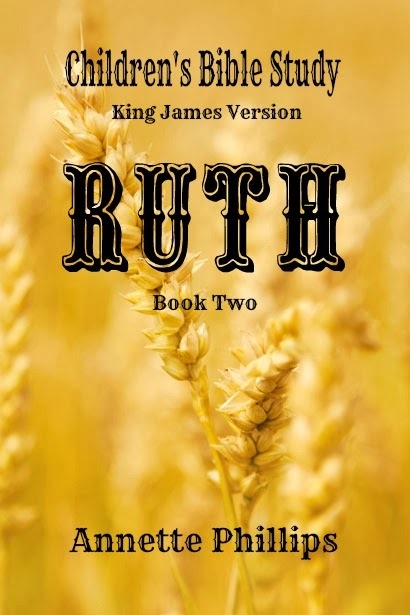 There are so many stories in the bible about God using women and children - like the story of Ruth or the little boy who gave his lunch to feed the 5,000! Isn't that wonderful to know!!! If we allow God to use us, there is no telling what can happen. Just like the bible stories above, the story of Deborah is also a true story of how God uses women to get the job done. In this Sunday School lesson, you'll learn how God not only uses one woman, but two and just how important they are. Ehud died. Teachers - don't just go by the Sunday School lesson below. Turn to Judges 4 and read it for yourself. You may find more information about the story you'd like to share with your class. During this time, Deborah, who was a prophetess, began to judge the children of Israel. 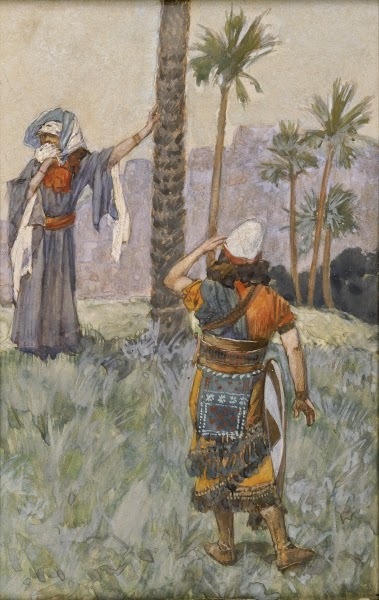 The bible tells us that she lived under a palm tree. Often, the children of Israel would come to her for help and for answers. You see, the Israelites were afraid of Sisera who was the captain of the Canaanite army. Sisera had a strong army with 900 chariots of iron and thousands of men. The bible tells us that for twenty years he kept the Israelites under his control, or mightily oppressed them. Finally, Deborah called for a man named Barak and said to him, "Barak, the Lord said for you to take 10,000 men into the mountains and He is going to lead Sisera's army down to the river. There the Lord will allow you to win the battle." But, Barak didn't want to go even though the Lord said he would win! Instead, Barak told Deborah, "If you will go with me into battle, then I will go. But, if you don't go with me, then I won't go." Imagine, this big strong man who is more than capable of leading an army of 10,000 men is afraid to go into battle without Deborah by his side! What do you think Deborah said to him? But before they left, Deborah told Barak, "You must know that the Lord is going to let a woman take care of Sisera the captain of the Canaanite army. You will not have the honor of killing him yourself." Just as the Lord said, Barak and Deborah led the Israelite army up to the top of a mountain. The Lord led Sisera and his army down near the river. When every thing was in place, Deborah said to Barak, "UP! For this is the day that the Lord hath delivered Sisera into thine hand!" It meant that it was time for Barak to take his men into battle! It was time to charge! The Lord had said that today was the day the Israelites were going to win the battle against Sisera and his army! It was time! We know they win, but how did it all happen? Well - When Sisera and his army saw Barak and his men coming down off that mountain, the bible tells us that the Lord confused Sisera and his army so badly that Sisera jumped down off his chariot and took off running. While Sisera's army was confused, Barak and his army took care of them all. There was not a single man left. Now, while this was going on, Sisera was still running. He ran until he came to a tent. There was a woman inside the tent named Jael. Jael told Sisera he could come into her tent and when he did, he laid down and she covered him with a blanket. Sisera told Jael he was very thirsty so she gave him some milk to drink. After he finished drinking, he said to Jael, "You stand by the door of tent and if anyone comes looking for me, you tell them no one is here." So Jael waited. Finally, Sisera fell fast asleep because he was so tired and worn out from all that running away. While he was asleep, Jael took a tent stake and killed Sisera. Which is exactly what Deborah had said, remember? Deborah told Barak that Sisera would be killed by a woman. Now, Barak was still chasing after Sisera and came to the tent where Jael was. When Jael saw Barak, she told him, "Come into my tent. There you will find the man you are looking for." Depending on the age children you have, you may want to tell them exactly how Jael killed Sisera. The bible tells us that she took a tent stake and drove it deep into his temple and fastened it into the ground. **Note: There are many times in the bible where God allows people to kill and often children and adults wonder how this is so when one of the Ten Commandments clearly states - Thou shalt not kill. When the scrolls were translated, the word kill was actually the word murder. What does this mean? It means that God commanded us - Thou shalt not murder. We are not to let hatred fester inside of us where we devise a plan to murder someone. If you like this Sunday School lesson, please share it with others. 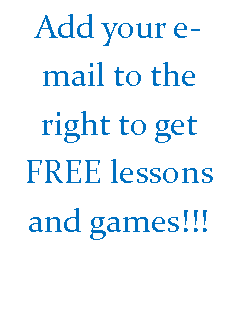 Also, be sure to add your email in the upper right side to get free Sunday school games and lessons! say" when you ask them to pray? While this may be all right for very small children, it is extremely important for kids to learn to pray as soon as possible - actually, for us ALL to know how. For most of us, we pray without giving it a second thought about if we are doing it right or wrong. And for the most part, as long as we are talking to God, it can't be truly wrong. But, it can be so much more right! In this Sunday school lesson, you'll find out what your Sunday school kids know about praying and may learn a thing or two yourself - I did. Before beginning your lesson, ask the kids if they have anything they would like the class to pray about. While taking prayer requests, take a few notes on what the kids say. You'll probably hear things like: pray for my mom and dad, my dog is sick, a kid in my class got hurt, my daddy's working, or even I'm sick. Write these things down as you will use them later in the lesson. Once you've taken prayer requests, go over the following verse. find that often kids will repeat bible verses without actually thinking about what they mean. 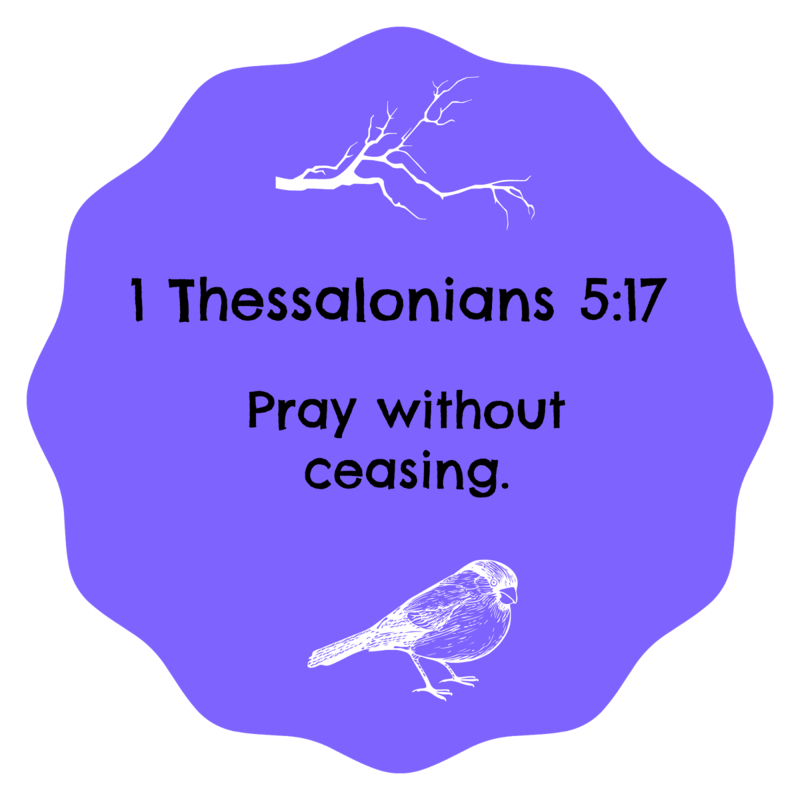 As they process the meaning, you may get a few questions about how you can pray all the time or pray without stopping. This is where you want your kid's train of thought to be as you start the Sunday school activity below. This activity will be your lesson as well. You'll find that by doing this activity, the kids will learn so much more about praying than by just 'telling' them how to do it. Note: The following activity was inspired by a lesson from Kids' Travel Guide to the Armor of God . Gather these items or come up with some of your own: pencils, paper, a picture of your pastor, a photo of your church, food items, drinks, articles of clothing, and a mirror. Divide up the items into stations around the room. Then, divide the kids up into groups for each station. Tip: The pencil and paper can be used to draw family members, friends, pets, etc. You can decide on this by what the prayer requests were at the beginning. The purpose of these stations is to get kids thinking about what God has given them and what each one means to them. For instance, the articles of clothing may spark thoughts of having warm clothes to wear or money to buy the clothes. But what about, the child that sits next to them in school that doesn't have many clothes or kids in other countries that don't have socks or warm coats to wear? The mirror will represent them looking inside themselves. Kids may think about the outward appearance, but what about how they can be better Christians or live the way God wants. Maybe some kids have trouble controlling their temper or always are wanting something they don't need. The food and drinks will let them see that God gives this to them and they need to be thankful. Also, there are many who don't have food and water. This is something we need to pray about as well. Get the kids thinking outside the box! Walk through the stations with your kids and talk about each one before you let them begin their own journey through each station. By walking through each one with them, you will be able to talk about each one and give them some things to help them think outside the box. Remember to pray for your pastor. The kids can pray for his health, but also that God gives him wisdom to lead your church as God needs it led or any number of things your pastor may need prayer for. Once you have walked through the stations, let the groups go through each one taking time to kneel down and pray. It may feel awkward to them at first, but by the time they get through each station it will be less awkward and you may find they are spending more time at each one. After the kids have finished each station, have them come back to you and sit down. You will need your notes you took of prayer requests at the beginning. At this time, you will be asking for prayer requests again here at the end of the lesson. You will find that once the kids have had time to think about the items in each station, their prayer request will have changed a bit. This is a good thing as they will have realized that prayer is more about asking for stuff. It is about thanking and praising God for what they have and praying not only for themselves, but for others. Of course, it is good to ask God to help yourself because we can't do it alone! Actually, we can't do it by ourselves at all! Please pass this along by clicking on one of the social media links below. 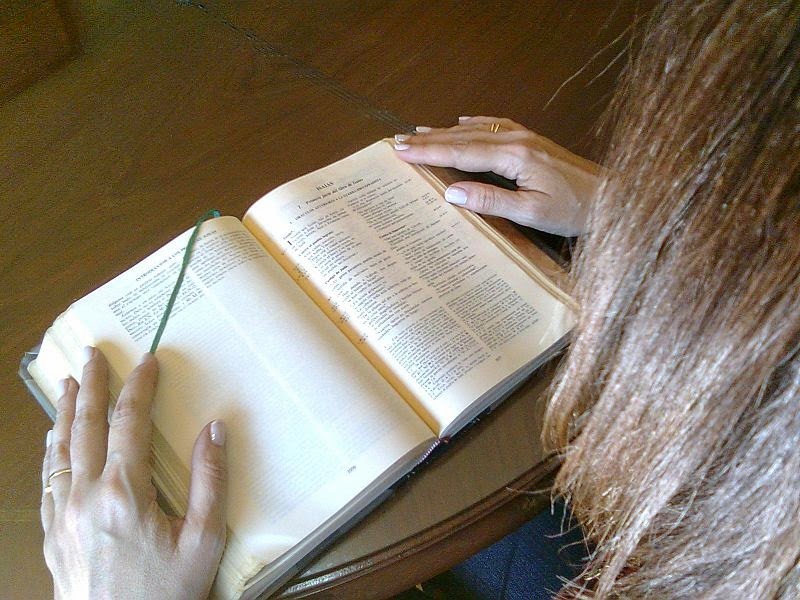 I love the Lord and want to share my posts with as many Sunday school teachers as possible. Thanks and have a great day! I love the bible story of Paul and Silas. It isn't your typical bible story you'd tell in your Sunday school class. But, if it is important enough to be in the bible, it is important enough to tell your kids. Are you wondering what is so different about this Sunday school lesson that you may be a bit apprehensive about sharing it with your kids? This story tells of a young slave girl who can tell the fortunes of others because she is possessed by an evil spirit. Now, before you shy away from this story, you can reassure your kids right off the bat that when they accept Jesus to be their Lord and Savior, they will never have to worry about such a thing happening to them. Of course, I've discovered over the years, that smaller children just take the story as is and don't question this part of it. The bible isn't sugar-coated and we shouldn't sugar coat it either! Before beginning this lesson, look up this bible story in your bible. You'll find it in Acts 16:16-40. Of course, the whole chapter is great, so read it all if you'd like! It is always best to prepare yourself before attempting to teach a lesson. I have often found that when I get in a hurry and don't study enough, one child will ask me a question I am unsure of how to answer. After you've read the verses, let's begin. One day Paul and Silas were on their way to prayer, when a girl who was possessed with an evil spirit met them. Because she was possessed, she could tell the future. Now, this wasn't an ordinary girl. She was a servant and because she could tell the future, she made a lot of money for her masters. The bible tells us in the book of Acts chapter 16 verse 17, the girl followed Paul and Silas as they went. As she followed, the girl shouted, "These men are the servants of the most high God, which shew unto us the way of salvation. Of course this was true. Paul and Silas were servants of God and they could show the people how to be saved, but day after day the girl followed them saying, "These men are the servants of the most high God, which shew unto us the way of salvation." which made it difficult for Paul and Silas to show anyone anything. You may want to repeat what the girl said several times to emphasized that what the girl said became a bit annoying and made Paul and Silas' job hard. What was their job? To show people the way of salvation of course! Here is a good time to ask the kids if they know what salvation means. Don't take for granted that kids understand this at any age. You'll be surprised at some of the answers you may receive. Wait for volunteers to give their meaning of salvation before telling that salvation means that you have accepted the Lord Jesus as your Savior. You believe that he came to earth as a baby, grew up, died on the cross, arose again, and now lives in heaven! When you believe on the Lord Jesus Christ, you will be saved. Salvation is a gift from God that saves you for eternity. Finally, Paul had had enough of the spirit and turned to the girl and said to the spirit, "I command thee in the name of Jesus Christ to come out of her." And guess what. He came out of her! Just by the sound of Jesus' name, the spirit obeyed. But when the girl's masters saw that she could no longer tell the future of others, they realized that she could no longer make them money. You see, the girl's job was to tell people their fortunes and the people paid her masters. Now that the evil spirit was gone from her, she could not tell anyone's future. Her masters were so mad that they caught Paul and Silas and took them to the rulers. The masters told the rulers that Paul and Silas were causing trouble and teaching things they shouldn't. Without even giving Paul and Silas a chance to talk, they beat them and threw them into prison. Their feet was also put into stocks. A jailer was in charge of the prison and all the prisoners. It was his job to make sure no one escaped. 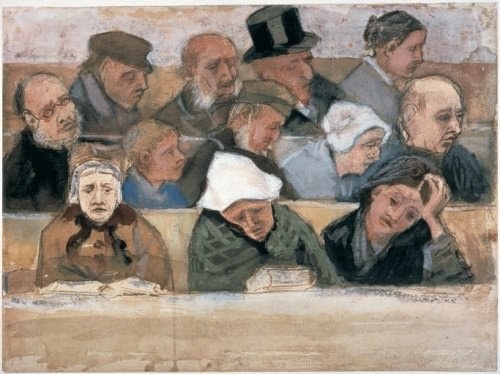 Now, for many people, if they would have been beaten and thrown into prison when they had done nothing wrong, they would have been crying, yelling, screaming, complaining, grumbling, or any number of things. The bible tells us that at midnight, Paul and Silas began to pray and sing praises to God!! 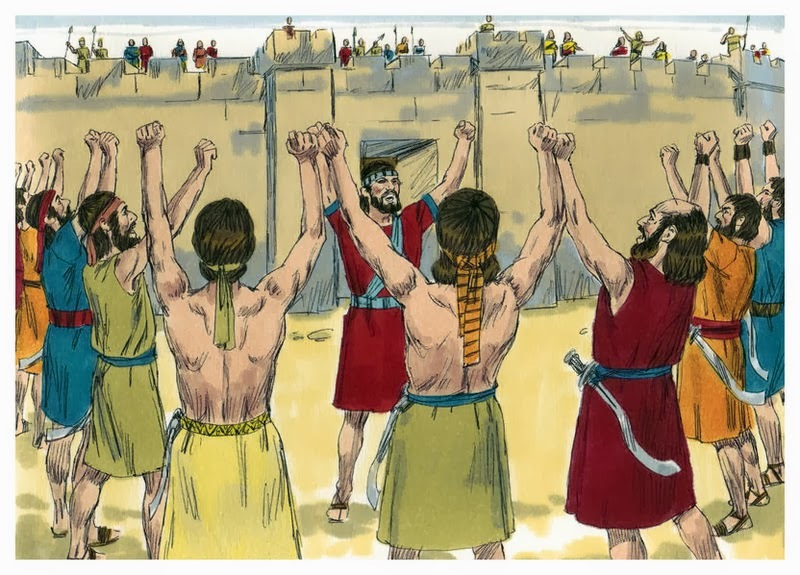 The other prisoners heard Paul and Silas singing and praising God! I wonder what they thought! Suddenly, there was a great earthquake. All the doors of the prison were opened and all the prisoner's bands came undone! You would think that all the prisoners would have taken the chance to escape, wouldn't you? When the jailer woke up and saw that all the doors were open, he knew he was in a heap of trouble because all the prisoners were gone. He didn't want find out what the rulers would do to him when they found out that he lost all of the prisoners, so he took out his sword and was going to kill himself! But, right before he did, Paul yelled, "Do thyself no harm for we are all here". None of the prisoners escaped! The jailer grabbed a light, ran into the prison and fell down before Paul and Silas wanting to know how he could be saved!! He realized that whatever Paul and Silas had, he wanted too. Paul and Silas told the jailer, that he need only to believe on the Lord Jesus Christ and he would be saved and all that was in his house. Right then and there the jailer was saved!! The jailer took Paul and Silas to his house and they told all that was in his house about the word of the Lord and everyone in the jailer's house was saved too! Imagine - because of the evil spirit inside the girl, Paul and Silas were thrown into prison, but because they were thrown into prison, a whole family was saved! We all have a little bit of the wise man and the foolish man in our lives. While this story about thedoes not obey is foolish, helping kids understand this and how it affects them is crucial in their Christian lives. Below is a Sunday school lesson that can be used for any age kids. This is a simple lesson that can be used to dig deeper into the word of God with teens and adults by adding more verses and discussing what God expects of us as his children. I've added a video at the bottom with the "Wise Man Song" with motions which is great for younger kids! have the kids interact more with you and each other. Often, interaction and discussion helps kids learn more than you think. Let's get their minds geared toward Jesus' lesson. Start by asking, "Have any of you been to the beach?" Or, "How many of you have played with sand?" "Did you make a sand castle?" "What did the water do to the sand castle when it washed over it?" After each question, wait for answers. 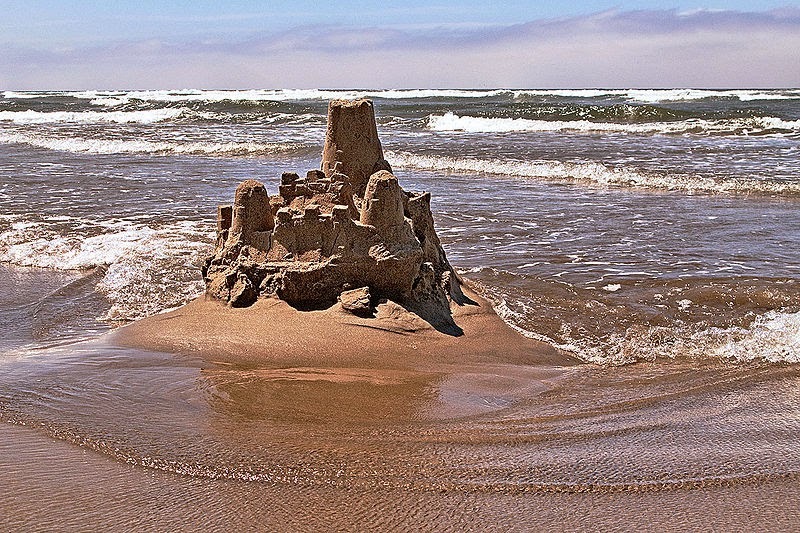 Younger kids will love to tell about what happened to their castle at the beach or even in a sandbox. Of course, the castle was washed away! Now, get the kids thinking by asking, "What do you think would happen if your mom or dad decided to build a house on top of a pile of sand?" Then ask, "Do you think if a big rain came and flooded the area it would make the house fall down?" Of course it would and kids will be able to visualize this because they know sand isn't strong nor can it stand up to water. The bible tells us that we are foolish if we build our house (lives) upon sinking sand. Be sure to find out if the kids know what 'foolish' means. Explain that Jesus doesn't want our thoughts, actions, or words to be centered around foolish things. Ask, "What are some foolish things we might do or say that would keep us from growing closer to God?" Answers may include: being jealous, lying, not obeying mom and dad, worrying, missing church for no reason, being a bully, and so on. Adults and teens will have more complex answers. When we put our faith, trust, actions, thoughts, and words in line with Christ the solid rock our Christian lives become stronger and others around us will be able to see Jesus in us. To begin about the wise man, ask, "How hard is a rock?" Say, "Rocks are really hard. We already know that we don't want to build our house on sinking sand. So, we should build it on something hard and solid, right?" Ask, "If our house was built on something hard and solid, what do you think would happen if the rains came down and the floods came up? Do you think it would wash away like the house built on sand?" That's what we want our lives to be like. When bad things happen, someone does something mean to us, we need to make choices, or feel like nothing ever goes our way, we need to think about Jesus and how he is like a solid rock. If we trust Jesus in everything we do and pray to him when we don't know what to do, he will help us build our lives on him - a solid rock. We can be strong in Him and with Him. No one can do it alone. That's why Jesus says he will never leave us. He wants to be there helping us each day and guess what - He is with us every hour, every minute, and every second. We never have to worry about sinking sand because with Jesus we are standing on a solid rock! Image courtesy of Curt Smith, Wikimedia Commons. Since the release of Colton Dixon's Christian song More of You, it is becoming more and more apparent that we spend our lives centered around our lives here on earth and not our spiritual lives. The bible plainly tells us we are not to do this. I've added a video below so that you can hear the song, More of You. You may wish to show it to your class to reinforce the fact that everyone is guilty of putting other things in their life before God. Below is the Sunday school lesson geared for your teens, but can easily be used for younger grades. You'll also need to make sure all of the teens bring their bible with them (some kids just don't think about it for some reason). Text them, tweet them, or even use Instagram to let them know they are going to need it. Using these social media devices is a great way to keep in touch with your kids during the week. Not only can you let them know you are thinking about them, but they can get in contact with you and you can also share a verse or a bible challenge with them. In this Sunday school lesson, you'll need to focus on today's world and what kids think about on a daily basis. As class begins and you have taken prayer requests and prayed, go to the white board. Ask kids what is the most important thing on their mind during the day. 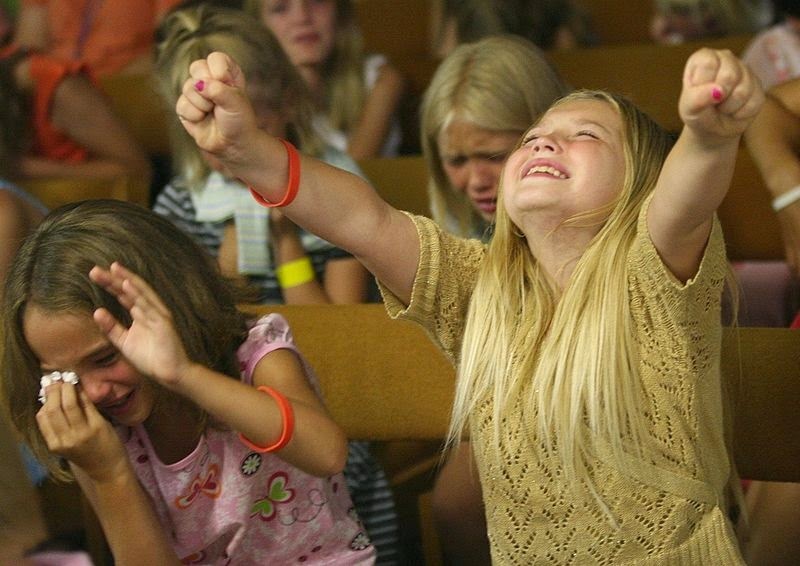 Of course, some kids will think you want them to say God and say it. That's great, but ask, "Is He really the thing you think about most during the day?" Let kids give answers and write them on the board. Some of our answers included: Minecraft (video games), music stars, selfies, school, sports and even homework. After you've complied your list, have the kids turn in their bibles to Colossians 3:1-2. Ask the kids what they think this verse means. Get them into a discussion about it. Discussions help open up their mind to God's Word and allows the kids to relate to each other by hearing what they think. Discussions also open up opportunities for teachers to answer questions that often may not have been asked otherwise. Now, give each child a piece of paper and a pencil. Have them write down ways they can put more of God into their lives and less of themselves. Some of our answers included: prayer, reading the bible, attending church more, and the usual answers kids might give. After they are finished writing and before you discuss what they wrote, get them thinking outside the box. Have them open their bibles to Galatians 5:25-26. Just like above, start a discussion about what they just read. We went through each part of the verse one at a time to allow time for deeper thought. Many kids do the things listed above without even knowing they are a sin and that the bible says not to do them. These every day sins keep us from walking closer with God and therefore causes it to be more of us and less of Him. Our goal is to reinforce more of Him and less of us. Once the discussion is over, have kids write anymore ways they feel they can have less of them and more of Him. Let them know that no one will look at their papers. These papers will serve as a reminder for them throughout their week to put more of God into their lives. Have them hang their papers in their room, carry them inside one of their books at school, or anywhere they will see it often as a reminder. Before finishing your lesson, think about showing the video below so kids can see that everyone struggles with this and it is something that we need to strive for each day. Image courtesy of Paul M. Walsh. Click image to follow the link. Have the students read the short story below. After reading, have them answer the question at the end of the story. Friday was Bob’s last day. I was in charge of planning the event. Bob had been a great friend and mentor, and I wanted to send him out in style. I walked through the office making a list of all the people that planned on attending. It was going to be a first class; Christian affair. We even planned to have prayer for Bob at the end of the party. I asked Mary if she planned on attending. Mary was recently saved, and I wanted her to feel a part of the Christian family at work. Mary was not convinced. She was a recovering alcoholic, and didn’t think it wise to attend. I told Mary that alcohol does not save or condemn. I encouraged her to come, because the safest place on earth was around believers. Mary nodded, and agreed to stop by. I felt bad. I only wanted her to be with us, and have a good time. Was what I did wrong? Answer: I should have respected the needs of the babe in Christ, and not tempted her into sin. As a Christian, I should have been more sensitive to Mary, and not put her in that position. Even strong Christians will face serious temptation. Those that are strong are sometimes more likely to fall because they let their spiritual guard down. As a Christian, it is never okay to fall; or to make excuses for falling. God does not give you more than you can handle. Flee means run! Sometimes, in order to avoid sin, you have to run. In the 23 Psalms, David proclaimed that he sometimes had to walk through the valley of the shadow of death. David also said that God prepared a table before him in the presence of his enemies. God does not remove - He guides. · They are not real. · The 10 Commandments warns against graven images. · Taking Holy Communion unifies our bodies with Christ; idol worship unifies us with the devil. · God cannot share space with evil. The Bible is full of examples of how the Israelites provoked God by doing wrong in His eyes. Read Numbers 25:9: Mention how Israel fell due to idolatry. The strong can sin by doing something that causes the weak to stumble. God is bigger than what you are going through. *Image courtesy of Kevin Probst. Teaching kids to share God's Word is more than sitting in a classroom and telling them to do so. Think about it - how often have you sat in the church pew and heard the pastor tell the congregation to go tell someone about Jesus today? Or invite someone to come tonight? Did you rush out of church to find someone to tell about Him or did you go home or out to eat? More than likely, you did the later - eat. The thing is - we need to GO tell people and not wait for them to come to us. If we wait until the 'time is right' or when 'God sends someone in your path', we may never get to share God's Word the way He intended for us to. The bible tells us to go out and teach all nations. Without us going out to teach and tell others about God, how will they ever know? Yes, there are thousands of missionaries out there along with pastors telling the lost about the Word of God. We can sit back and rest assured that someone will tell the lost about Christ. We can even make sure to give our money to support the missionaries out in the field risking their lives to tell others. But, that isn't what God commands us to do. The bible also says, faith comes through hearing the Word of God. So, how can the lost have faith in something they've never heard? The best way to teach kids to share the Word of God is by doing it! Over the next few weeks, come up with a plan to visit people in the community, go to a nursing home, have a FREE family night with games and food, put on a play, deliver food to a family who are struggling, or anything else you can come up with to get people who normally do not attend church in a position to tell them about the Word of God. Make sure the kids are involved through the whole process especially older children. Teens and pre-teens are at an age that sharing God's Word may feel awkward if they have never done it. Like many Christians, teens have sat in a classroom on in a pew 'listening' only. Now is the time to get up and DO! Remember, Jesus told four unlikely fishermen to follow him and he would make the fishers of men instead of fish! This is what we are to do - follow Jesus and become fishers of men! We should leave our nets and follow him NOW! Plan on making it a routine to 'spread God's Word' not just once a year. Children (and adults) learn by repetition, so be sure to repeat telling others about God. 1 Corinthians 10:31 KJV says "Whether therefore ye eat, or drink, or whatsoever ye do, do all to the glory of God." This is a hard concept to grasp at any age. Yes, we know that we are suppose to do everything to the glory of God, but how can what we eat and drink be done for God? Teaching Sunday school children early that doing everything for the glory of God is a way of life instead of just occasionally, will help them to grow to become strong in the Lord and have a wonderful relationship with Him along the way. Before class, come up with several scenarios that your kids can relate to such as: being bossy, sneaking extra cookies, skipping church to ride bikes, throwing rocks at the neighbors dog, and so on. Also, come up with a few good scenarios such as helping mom carry in groceries, putting shoes away, picking up toys, sharing, and so on. Now, we are going to use these scenarios to get the idea of doing everything for God rolling! Begin by mixing up the good and bad scenarios and asking the kids if they believe the scenario is doing something for God or not. This will help to get their train of thought working. Now, ask, "Do you think that stuffing yourself with a whole extra-large pizza can be done for the glory of God?" The answer of course is 'no'. God did not design our bodies to be stuffed full at every meal. He gave us food to sustain us and to enjoy, but not to overeat. Ask, "What about smoking or drugs?" We are to treat our bodies like the temple of God it is! Overeating, smoking, drugs, and other corrupt things were not meant to be used by our bodies. Now, ask, "Since we know that putting things inside our bodies that shouldn't be there is not glorifying God, what do you think about what you drink?" Of course many children will know that alcohol will not glorify God, but what about other drinks? God wants us to enjoy what we drink as long as it isn't hurting us, but drinking sodas, sugary drinks, and other drinks that were not designed by God for us to drink can harm us if drank in over abundance! Believe it or not, drinking too much water or milk can even harm our bodies! Read about the risks of drinking too much milk here. Read about the risks of drinking too much water here. We are to partake food and drinks to sustain us and not for gluttony or to look cool. There are ways to glorify God in all that we do even as children. 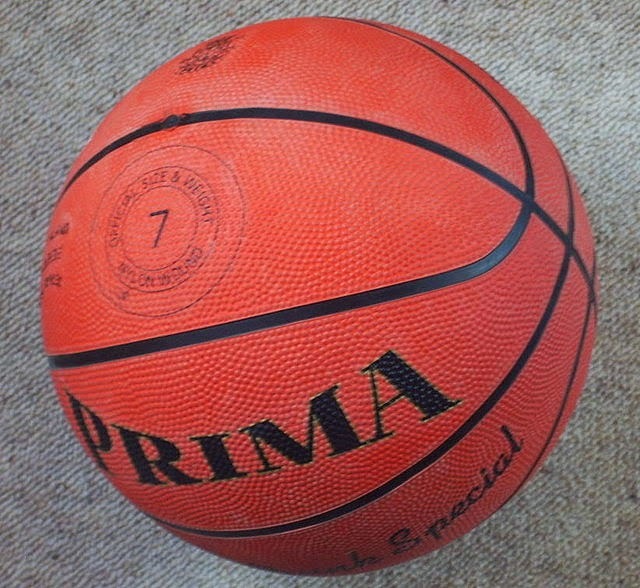 Have the kids think about their every day activities: soccer, basketball, fishing, hunting, school, and so on. Express the importance of using all of their activities for God. All of our actions, words, and motions we portray can let others see God in us. We can let God shine in us so others may want to know more about God. Have you ever heard the saying, "I like your God, but I don't like your Christians?" This can be very true about so many non-Christians. Non-Christians look at us and can't see Jesus anywhere in us! What a sad thought. How often do we gripe, complain, grouch, yell, get angry, and so on. These are not attributes of God. We are all guilty of these things, but because of God's mercy, we can ask forgiveness and start again! Praise the Lord we serve a loving God! I learned a lot myself from this Sunday school lesson! No matter what age children you teach in Sunday school, they need to understand the importance of asking Jesus to be their Savior and living a life for God. While sharing bible stories is an important part of teaching God's word, our main goal is to lead these children to Christ and to teach them how to lead others. So, as you teach each and every lesson from here on out, do it with one goal in mind - winning souls for Christ! Begin your Sunday school lesson by recalling Jesus' birth. Children need to understand Jesus didn't have to leave heaven to come to earth as a baby. He chose to. He wanted to. Jesus left his beautiful wonderful home in heaven where there was no sin, no sickness, no hurt, and no sadness to come to earth where all of this existed. He grew up just like all children do. He was a toddler, a young boy, a pre-teen, a teenager, and then a young man. He obeyed his mother, Mary, and his earthly father, Joseph. He learned how to work with wood because Joseph was a carpenter. He also got hungry and tired. He needed sleep just as we do. For around 30 years, Jesus lived as any of us would have except for he never sinned. Try to imagine never doing anything wrong. It's impossible! Some people believe they have never did anything wrong, but we all do. When Jesus was 33 years old, he died on the cross for our sins. Of course, he didn't stay dead. Praise God! After they placed Jesus' body in the tomb, it stayed there for 3 days and then a miracle happened! He arose from the dead! It was because Jesus died on the cross for our sins that one day we can live with him forever in heaven. Now, here is where you will begin telling the bible story of the woman at the well. Today's bible story is about a Samaritan woman who came to a well to draw water out of it. Jesus disciples had went into town to buy meat, but Jesus decided to rest beside the well. Of course, it wasn't by accident he was sitting by the well. He knew a woman would soon be approaching. Leather bucket drawing water from a well. What Happened in the Bible Story? When the woman came to the well, Jesus asked her to give him a drink of water. She was a bit taken aback that he even spoke to her because she was a Samaritan and Jesus was a Jew. In those days, Jews were not very fond of the Samaritan people. Jesus said to her, "If you only knew who I am, then you would have asked me and I would have given you living water." The woman didn't understand what Jesus was talking about. 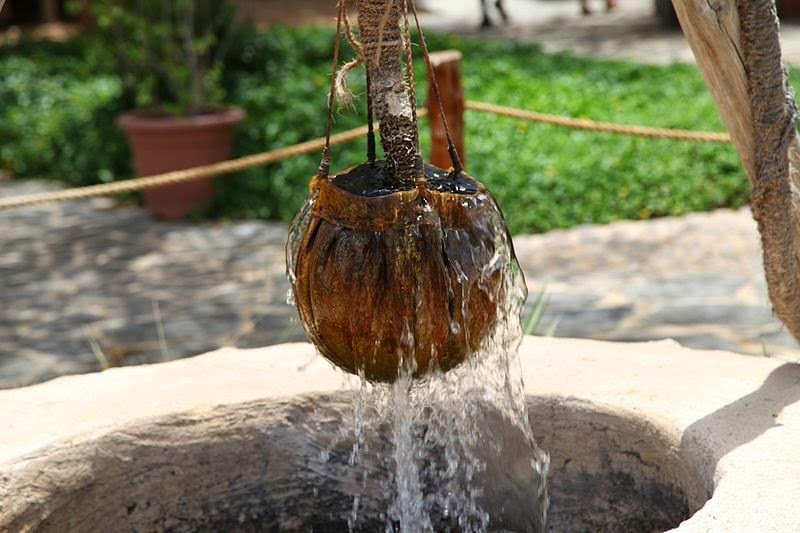 Jesus had no bucket or rope to get water with, so how could he give her 'living water'? You see, wells were often very deep and without something to draw up water with, you couldn't get to the water. Think about it: Water was often hard to get. Women and children would have to work hard each day to get the water needed to cook and to drink. What about the water for animals? It was no easy task! 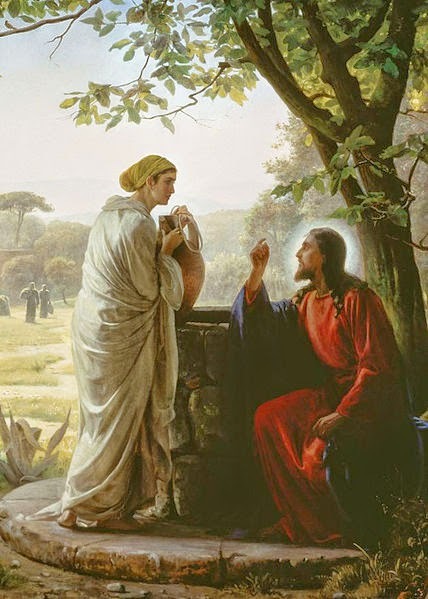 Jesus wanted this woman to understand that the water she drank would only keep her from being thirsty for a little while. As the hours passed, she would become thirsty again. The next day, she would have to come to the well to get more water to drink, wouldn't she? Have the kids think about that for a minute. Say to the kids, "When it is in the middle of summer and you are outside playing, you like to drink water, right? (wait for answers) But, just because you get one drink of water, it doesn't mean that you won't need another drink. After you play for a while, you'll get thirsty again, won't you?" Of course they'll get thirsty again. The living water Jesus was talking about was eternal life! Only Jesus could offer this woman a way to live forever. Salvation is referred to as living water and only through Jesus Christ can we have eternal life - a life where we can live forever in heaven with him! The woman wanted this 'living water' and ran to get others in the town to come to hear what Jesus had to say! We should be like the woman at the well and bring others to church with us to hear about the Word of God! If you'd like to read a bit more about 'living water', visit the website Got Questions. Teaching children to be humble can be hard. We all want our children to be proud of what they accomplish, yet being too proud can lead to the opposite of humble! Think about the children you see on the playground, on the ball field, at competitions. Many children nowadays tend to be arrogant. All too often, I hear the words, "Your going to lose. ", "You can beat me!" or "I'm better at this than you'll ever be." These are not words Jesus wants us to say to others. Teaching our Sunday school class about being humble and how Jesus was humble is a step in the right direction. Talk to them about putting others first, thinking of others feelings, and helping others when they need help. Of course, teaching them to compliment and encourage others isn't a bad thing either. Being by talking to your class about what the word humble means. As you being this Sunday school lesson, talk about how wonderful Jesus is. Have the kids think about all the wonderful things Jesus did while he was here on earth. Be sure to compliment their words and encourage them to think of more. You may even want to have a few of your own written down to add to their list. 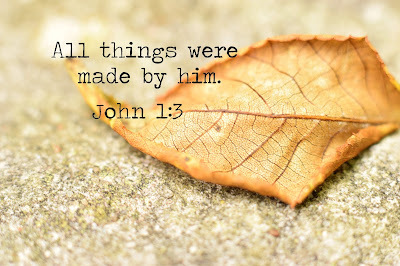 If your class consists of older children, have them turn in the bible to John 13:4-9 (KJV below) and let them take turns reading the verses below. After each verse, tell about what the verses mean so they grasp the story more fully (see below the verses for more). 4 He riseth from supper, and laid aside his garments; and took a towel, and girded himself.5 After that he poureth water into a bason, and began to wash the disciples' feet, and to wipe them with the towel wherewith he was girded. We see in verse 4 that Jesus is setting at supper with his disciples - The Last Supper. Jesus laid aside his garments which simply means he removed his robe. Taking a towel, he placed it in his belt. Jesus poured water into a bowl and stared to wash and wipe the dirt with the towel from each of the disciples' feet. When he was ready to wash Simon Peter's feet, Simon Peter asked Jesus why he was washing his feet. Peter didn't understand. Jesus tells Simon Peter that there is more to what he was doing than just washing feet. Even though Simon Peter didn't fully understand what was going on and why Jesus was doing this, he would soon enough. Simon Peter then objected to Jesus washing his feet! He goes so far as to say never! Jesus calmly tells him that if he does not wash his feet, then he will have no part of him. Simon Peter loved Jesus. He wanted to be with Jesus and be a part of him and changed his mind quickly. He thought that if he could be with Jesus and be a part of him just by having his feet washed, then he wanted Jesus to wash his whole body too! Be sure to get the Sunday School Activity that goes along with this lesson. It's FREE! In bible times, there were no roads or sidewalks. People wore sandals and the dirt on the roads made their feet really dirty and dusty. When someone would enter into another person's house, a servant would normally wash the guest's feet. Since Jesus had a room prepared to eat the last supper alone with his disciples, there were no servants there. Think of this first...why didn't one of the disciples think about washing the other's feet? Did they think they were too good to do it? Would they have been embarrassed? Did they worry about what the other disciples would think of them and didn't want to be ashamed? Thankfully, Jesus showed his disciples, and us, that we should be humble and not ashamed to wash someone else's feet. It also shows us that we should never be ashamed and always be humble when it comes to doing things for the Lord. Of course, there was more to the feet washing than this. When we dig a bit deeper, we see that to be washed means to be saved. When you ask Jesus to come into your heart to live forever, the bible tells us that you will be washed as white as snow! Even though Jesus washed the disciple's feet to show humility, their feet became dirty again when they left the room. But, when we are washed white as snow from our sins, we never have to worry about being washed again! Once you are saved, you never have to worry about not being saved again! You can rest assured that you will one day be in heaven forever! Jesus died for our sins so that we could live in heaven forever! All we need to do is not be ashamed and step forward to ask Jesus into our hearts. Have the kids to close their eyes. Ask if anyone in the room would like to have Jesus in their hearts. This is what we as Sunday school teachers are there for. To help lead little ones to Christ. Be sure to read Romans 10:9-10 KJV to prepare yourself for this lesson. With the Lord's help, you can lead a lost child to Christ. Before teaching this Sunday school lesson, pray that God will open the hearts and minds of the children in your class and that he will help you say what needs to be said to teach his word. The bible story of Samson isn't as well-known as many others, but that doesn't mean it shouldn't be told. In fact, Samson has some unique stories (all true, I might add) that kids will love. 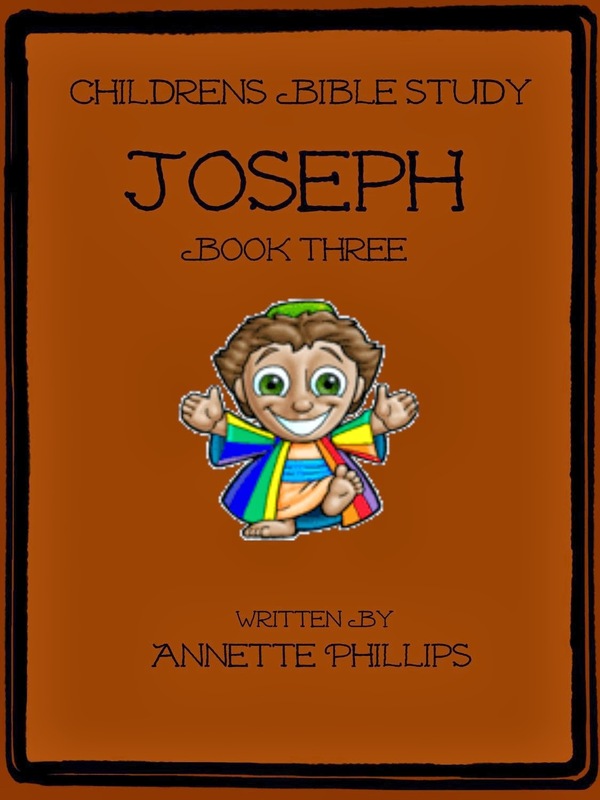 You'll find that with most of the bible stories of Samson, you will need to be prepared to answer many, many questions as quite a few aspects of his life are things children have never heard of before. In this Sunday school lesson, we will cover what it means to be a Nazarite and tell the story of Samson and the lion. This story sets the scene to show children just how strong Samson was. To read this story in full, turn to Judges 13 and 14. 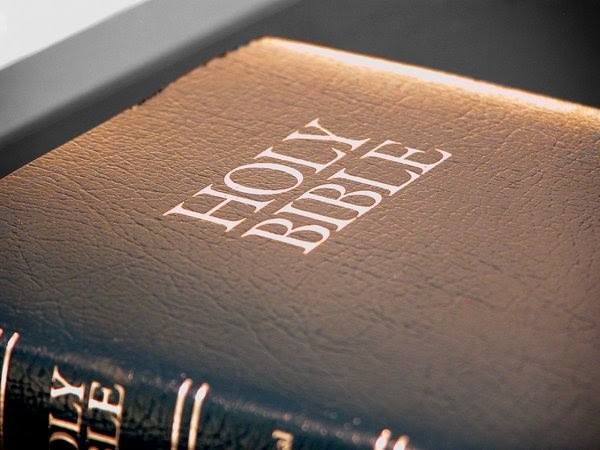 Use this time to study the bible for yourself as it is very important not only as Sunday school teachers, but as Christians to study God's word. Before Samson was born, the Angel of the Lord appeared to the wife of a man named Manoah. The bible does not tell us her name, but it does tell us that she had been unable to have any children. When the Angel of the Lord appeared to Manoah's wife, he said, "You have never been able to have children, but now you are going to. You are going to have a son." Can you imagine what it must have been like to have an angel appear out of nowhere to give you a message? Ask the kids, "Do you think you would have been scared? What about excited? Maybe you would have thought you were dreaming." Wait for the kids to think about this. Let them talk about this for a moment, then begin again. Before the Angel of the Lord left, he gave Manoah's wife a few rules to follow as she raised her son. She was not allowed to cut his hair. He wasn't allowed to eat anything that was unclean. He was not allowed to drink wine or other strong drinks. Note: If you have older children, you may want to elaborate on each one. We will discuss number one below. Samson was to be a Nazarite from birth. A Nazarite did not cut his hair at all, eat anything that was unclean (or touch anything that was dead), or drink alcohol. A Nazarite's long hair let people who saw them know that they were doing God's will and that they were a Nazarite. The Angel of the Lord even told Manoah's wife that she was not allowed to drink certain things while she was pregnant with the baby. After the Angel of the Lord left, she ran to tell her husband what the angel had said to her. Then, Manoah asked God to let the Angel of the Lord come back again to teach them how to raise their son. God heard Manoah. One day when Manoah's wife was sitting in a field, the Angel of the Lord returned but Manoah wasn't with her this time either. Quickly, she ran to get her husband and he followed her to back to the angel and he said, "While your wife is pregnant, she is not allowed to drink anything containing grapes. When she has the baby, he is not to drink anything containing grapes, he is not allowed to touch anything dead, and he is not to cut his hair." Get the Samson and Lion Maze. Get the Book of Judges Coloring Page. When Samson was born, Manoah and his wife did as the Angel of the Lord instructed. They did not allow Samson to eat or drink anything that had grapes or grape juice in it, he did not touch anything that was dead, and he never cut his hair. Samson grew into a man still following these rules from God. 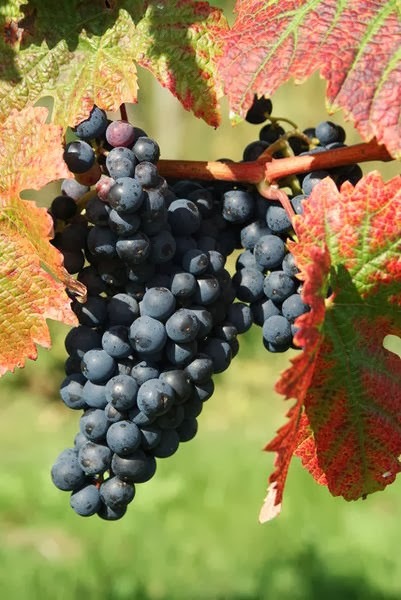 One day, Samson was walking along and came to a vineyard (where grapes are grown). Samson didn't know it, but there was a lion in the vineyard. As Samson came near, the Spirit of the Lord came to Samson making him very, very strong. You see, Samson didn't have a sword or a staff that he used to fight off the lion. Instead, when God made him extremely strong, he used only his hands to kill the lion. 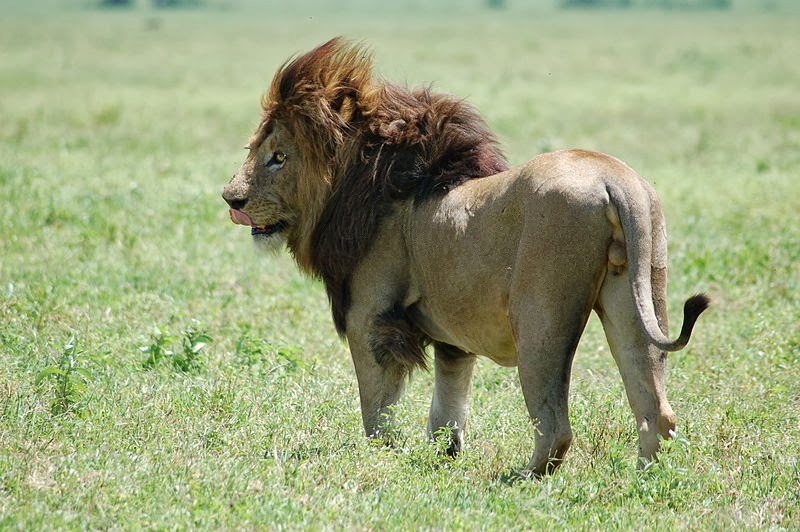 Imagine, being so strong that you could take on a lion all by yourself and with no weapons at all! As the years passed, Samson's hair grew. As long as Samson did not cut his hair, he stayed strong. If he ever cut his hair or his hair was cut at all, he would become weak and his strength would leave him. There was one time when a girl tricked Samson and his hair was cut! But, that is another Sunday school lesson for another day. Find more FREE Sunday school lessons! I love to read about Joshua in the bible. So many times as I read through his bible story, I wonder what it must have been like to have been him. Imagine, not only did Moses appoint him to take over for him, Jesus himself came to talk to him face-to-face! The Sunday school lesson below tells of that one time when Jesus came to Joshua to tell him exactly how he was going to defeat Jericho! Instead of having to come up with a complicated (and maybe wrong) plan as to how to overthrow the city, Jesus said, "Listen up, Joshua. This is what we are going to do!" While we can't see Jesus face-to-face yet, he still talks to us. We need only to quiet our minds and listen. Having a relationship with our heavenly father is more than attending church once a week and reading a bible verse every now and then. It's about talking to him daily and listening as he talks back. It may not be the way we hear those here on earth, but it could be in nature all around us, in the verses we read each day, in the whispers we hear in our hearts, in the song that just played, through other people, or any number of other ways God speaks with us. As you prepare for this Sunday school lesson, talk with God to ensure that he helps you deliver the bible story the way he wants you to. Show your kids the Battle of Jericho Song to get them up an moving! You can also find more FREE material about Joshua! You are free to print the images on this page to use in your Sunday school class. The license for using these pictures are located at the bottom of this post. In this Sunday school lesson, we are going to do more than just tell a bible story about Joshua. We are going to engage our kids to think about what it was like all those years ago when the Israelites fought the battle of Jericho! You will want to see how to get your kids thinking like Joshua and the Israelites by doing this Sunday school activity! Whether you choose to use the link above to get the kids fully involved in the story or not, you can still get them moving by following along with the suggestions in parenthesis below. To begin your story, have the kids sit in a circle in the middle of the room or pull their chairs into a circle. You can either stand or sit in the middle to tell your story or even just pull yourself up a chair to sit with them. The Israelites had been wandering in the wilderness for 40 years and it was finally time to enter into the land that God had promised to them. Of course it hadn't been easy to get to this point and it wasn't going to be easy now. They had to cross the Jordan River to get to the other side. Now, that may not seem like a big deal, right? They could just jump on a boat and sail to the other side or find a bridge to cross - wrong. They didn't have any boats or any bridges to cross and the river was flooded at the time. Its waters were probably rushing fast and would have swept them away. Another thing was that there wasn't just a few people. There were hundreds of thousands of people who had to cross the river. Of course, we can't forget about all the animals and the fact that they had to carry all of their belongings with them. So, how do you think they were going to get across? Joshua told the people, "The priests carrying the ark will go first. Everyone will wait and follow along behind the priests. 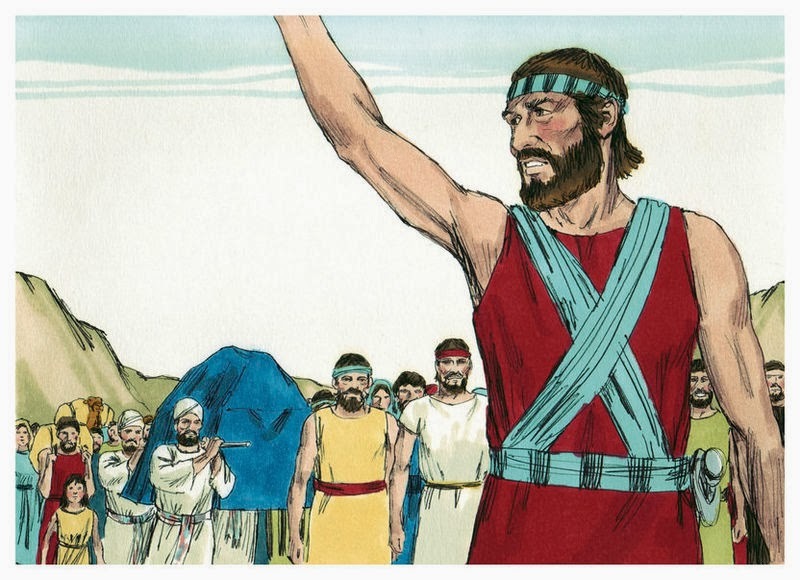 Ask the kids, "Joshua said the priests were going first and everyone was going to follow. How do you think they are going to get across?" A miracle happened that day. When the priests' feet who were carrying the ark touched the water's edge, the water stopped flowing and was held back. The people got to cross the Jordan River on dry ground! 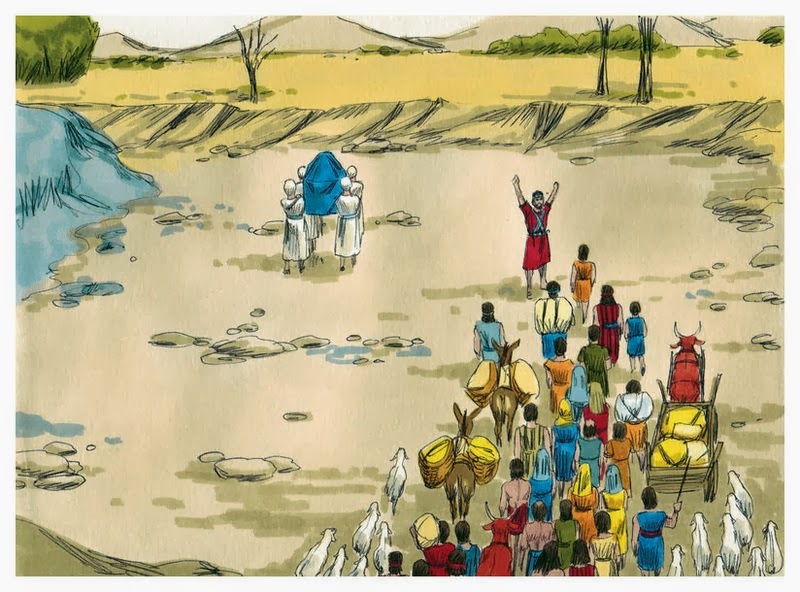 As the people crossed, Joshua told 12 men to pick up one rock each from the river's bottom and carry it to the other side. 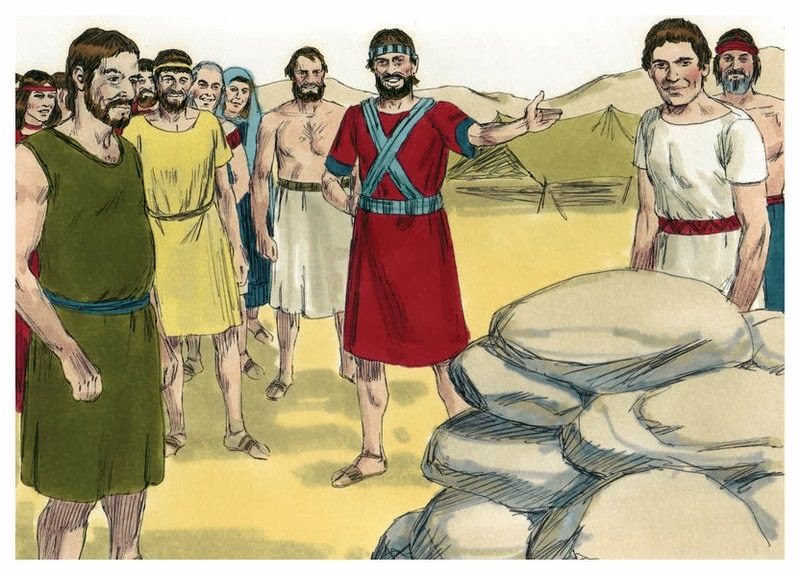 When they reached the other side, Joshua had the men pile the rocks up. Then he said, "This pile of rocks will serve as a reminder to you all. When your children or grandchildren ask why this pile of rocks is here, you can tell them about this time. The time when we crossed the Jordan River on dry ground!" The river didn't start flowing again until the priests came out of the river. You see, they had to stand in the middle and wait for all those people to cross before they could come out of the river bed themselves. Now, Joshua and the Israelites were faced with another problem. They were to take over the city of Jericho, but the walls were so high and thick they couldn't get over them, or around them, or through them. How were they going to get into the city? One evening, Joshua walked by himself trying to figure out a way to take over the city. To his surprise, a man holding a sword appeared out of nowhere! Joshua asked, "Are you for us or against us?" The man said, "I am the captain of the Lord's host." Does anyone know who the captain of the Lord's host is? It was Jesus before he ever came to earth as a baby! Joshua was talking to Jesus himself! Jesus told Joshua to take off his shoes because the ground where he was standing was holy and Joshua did as he was told. Then, Jesus said, here is how you are going to defeat Jericho." Jesus said, "On the first day, the people will walk around the city walls one time. They are not to speak at all. On the second day, they are to do the same. They are to do this every day for six days. On the seventh and final day, they are to walk around the city walls seven times. On the last time, the priests will blow their horns loud. When the people hear the horns, they are to SHOUT very loud!" Jesus went on to tell Joshua not to worry or be afraid. Jesus was going to go before Joshua and he was going to be right with him through the whole thing. Joshua had nothing to fear! 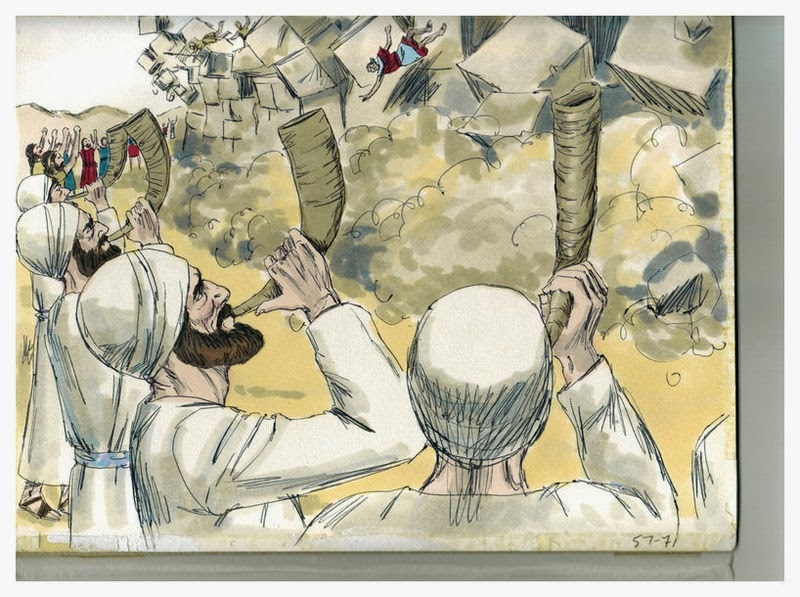 Joshua followed Jesus orders and on the seventh day when they walked around the city walls of Jericho seven times, the people shouted when they heard the priests blow their horns and the walls of Jericho came tumbling down! The people of Israel overtook the city. Photos of Joshua courtesy of Wikimedia Commons and Distant Shores Media/Sweet Publishing.